HILL TRACKS - A Summer for Action! Hill tracks remain very topical for NEMT with things happening on all three fronts. As reported in our last issue, following the CNPAs decision to appeal against the Reporters finding, the matter has been returned to the Reporters Unit for re-determination. As part of this exercise, the Reporter wrote to the original objectors asking for any significant new evidence. Our response, as reported back to SEIRU is here. This development raises an interesting point. The Scottish Executive Inquiry Reporters Unit acts in cases where people wish to appeal against a local authority planning decision. However, if you wish to appeal against one of their findings, you appeal to the Court of Session and, if they uphold your appeal, the matter is sent back to exactly the same unit for re-determination. Thus, the matter is sent back to the same people who made the original flawed finding. Given the seriousness of this situation NEMT has written to Richard Lochhead MSP and John Swinney MSP in their new and key roles in the Scottish Executive: letter to Richard Lochhead and John Swinney (PDF). We await the new determination on this track from the SEIRU with considerable interest. As reported in our last issue, the Reporter upheld the estates appeal against re-instating the track. We, the NEMT, dont have resources to appeal a Reporters decision, as this requires an approach to the Court of Session, where lawyers fees vary between prohibitive and astronomical. The Marr Area local planning committee (Aberdeenshire Council) did consider an appeal but were strongly advised against this by their officials, on the same grounds of potential costs involved. In the end, no appeal was mounted. We will be monitoring the estates compliance with the conditions attached to the planning permission. These conditions have been effectively endorsed by Scottish Natural Heritage and form part of the Reports argument for allowing planning permission. We need to see what actions are open to us should the estate not carry out the required remedial work. We should not see this as a defeat. We have sent a strong message to potential track builders that we will challenge indiscriminate track building. In the future, if estate owners want to do some road building, for reasons that cannot be supported, then they will have to factor in the costs of a possible appeal. There may also be potential costs of reinstatement should an appeal prove unsuccessful as happened with the Balmore to Auchtavan track or remedial works become part of the conditions attached to planning permission. If all we have done is to make them think twice in the future, then that is an achievement. 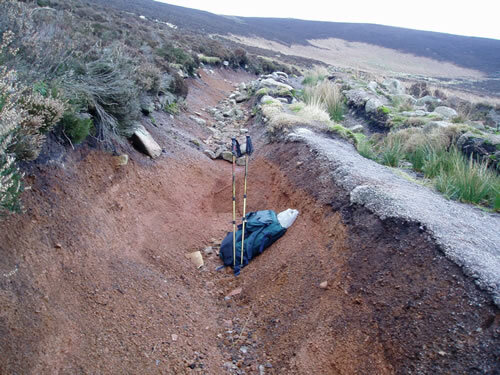 NEMTs project to compile a database on hill tracks in the Cairngorms National Park, using GPS and digital photographs moves ahead steadily. We are close to agreeing funding for the initial Pilot from both SNH and CNPA. Weve also had some good publicity in the Press and Journal. By the time that you read this, an explanatory Instruction CD that includes good training on how to work the GPSs, and a Data CD for returning the data you collect, together with laminated support sheets will have been sent out to the first wave of volunteers to start this years pilot. More details can be found on the NEMT website where your can also register to take part. How about signing up and we will send you our CD and the instructions? Its not complicated and can be fitted into your normal outings. No special trips should be necessary, you will probably learn a lot and the Project will greatly benefit from your help. Please also watch our website for updates.